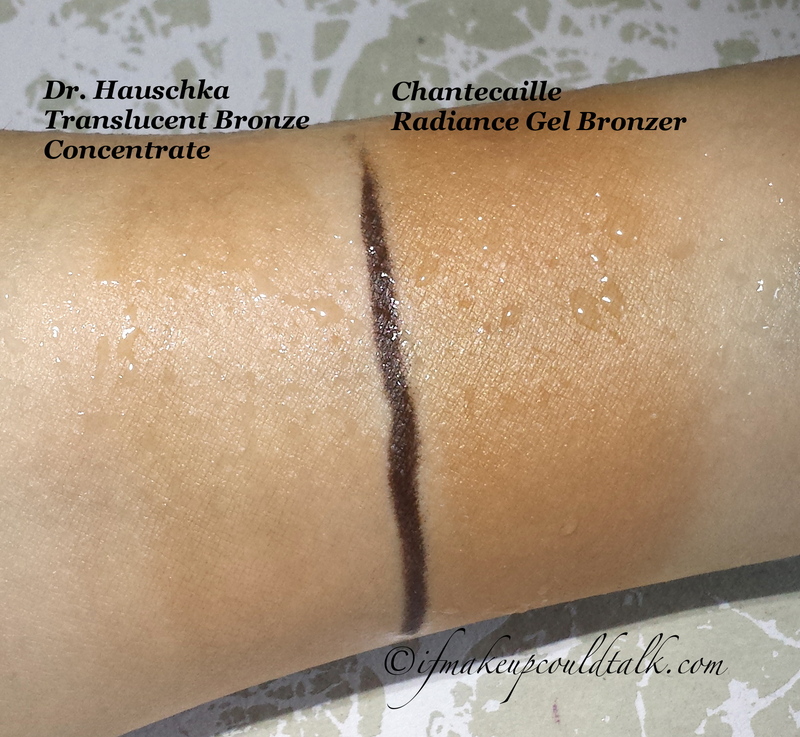 Chantecaille Radiance Gel Bronzer review, photos and comparisons. Bronzers come in a variety of forms: powders, creams and gels. I have a particular weakness for gel formulations. Bronzers that are formulated with a gel-like consistency tend to blend seamlessly into the skin and last longer than any other formulation. Chantecaille Radiance Gel Bronzer ($56 USD/ 1.3 oz.) is an example of a gel bronzer done right. This beautiful golden bronzing liquid imparts a truly “natural” and refined summer-time glow. Ladies and gentlemen, here comes the sun! Imparts a subtle radiance due to silica and mica in the formula. Formula is thin, but has a concentrated consistency. Wear time is 10 hours + when worn alone or under foundation. Small amount needed to achieve results. Lightweight formula blends out smoothly and evenly without a sticky film. Can be built-up without appearing patchy or uneven. Can be applied with fingers or a brush (Wayne Goss 01 Brush). Medium and darker skinned beauties can get away with wearing this bronzer alone to even out skin tone and add a touch of radiance. When I applied this to my sister (she much darker than I am) she barely needed foundation to finish off her look. Dry-tme is very forgiving (low-level of alcohol). 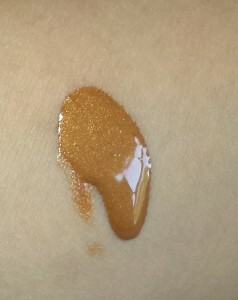 Can be mixed with lighter foundations to deepen color for summer time wear. Plastic squeeze tube is travel friendly and efficient–you can get every last drop out. 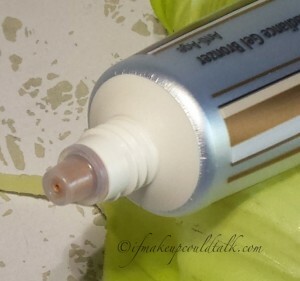 Product flows smoothly out of the tube, does not coagulate at the opening. Chantecaille’s signature light rose fragrance is pleasant and non-offensive. Formulated without parabens, however, this puppy is loaded with silicones. According to Chantecaille, “A Youth-Preserving Bearberry Complex provides anti-glycation and anti-oxidant benefits”. If too much bronzer is dispensed there is no possible way to get it back into the tube. 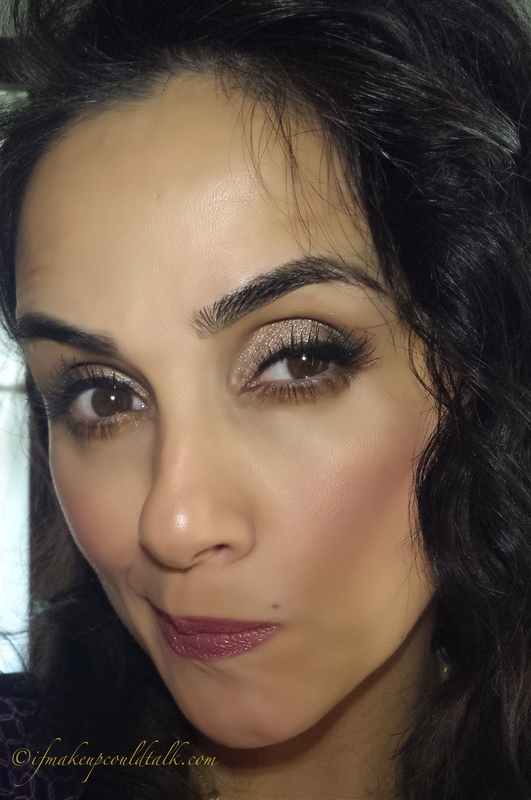 Can look orange, if too much product is used–especially on lighter skinned beauties. Second ingredient is Isohexadecane, a highly pure derivative of petrolatum (aka: mineral oil) used as a thickening agent and skin conditioner. I would have preferred Castor Oil for the price point. Chantecaille claims, “Raspberry Stem Cells repair DNA damage, and prevent inflammation and the absorption of free radicals”. The ingredient Rubus Idaeus Leaf Cell Culture (raspberry cell) is toward the bottom of the list; highly improbable that this will have any effect on the skin, let alone DNA damage. The “anti-glycation” effect, due to the bearberry complex (Arctostaphylos UVA URSI Leaf Extract) is also low on the ingredient list, and unlikely to have any effect on the skin—but it is a nice addition, as opposed to having another chemical added. 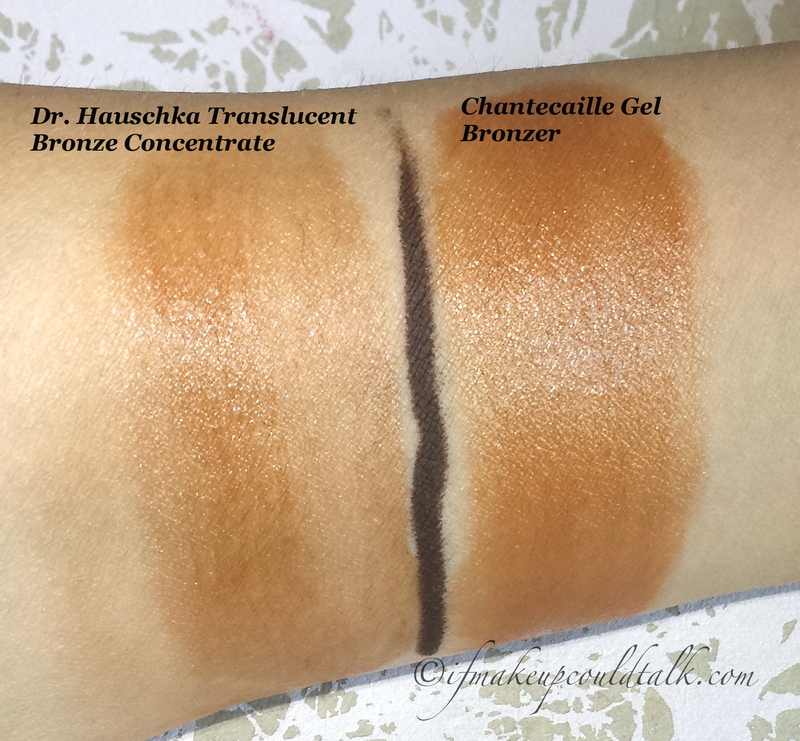 Dr. Hauschka Translucent Bronze Concentrate, Chantecaille Radiance Gel Bronzer. Dr. Hauschka Translucent Bronze Concentrate ($39.95 USD/ 1 fl.oz.) is housed in a glass jar with a pump. This packaging, although sanitary, is not travel friendly and the pump has a tendency to get clogged very easily between uses. Typically, product would get trapped within the inner top portion of the pump, harden over night and expel a dried coagulated sediment the following day–quite annoying. 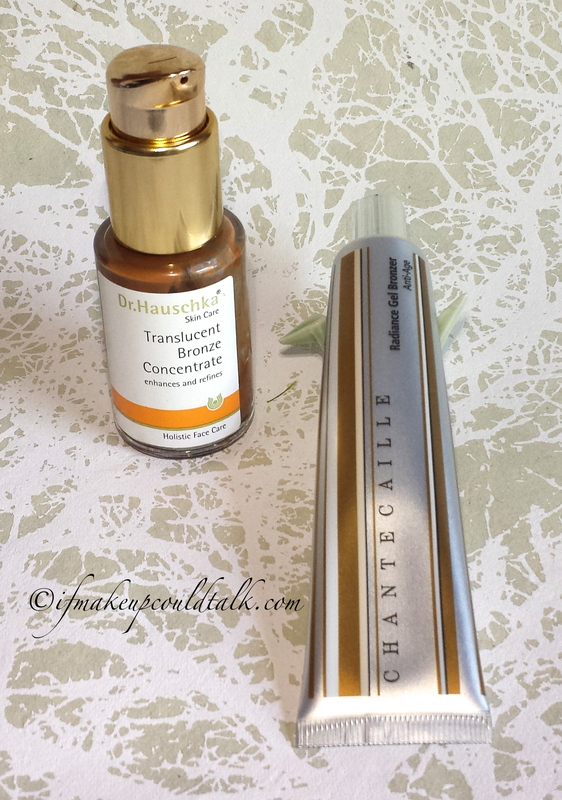 Both formulas are unbelievably lightweight, however, you can tell Dr. Hauschka is thinner and not as concentrated as Chantecaille. Both formulas blend out very nicely. 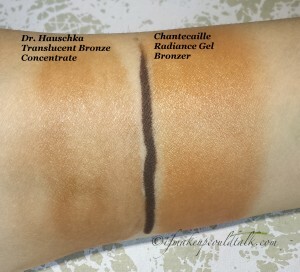 However, when sheering-out the bronzer further, Dr. Hauschka Translucent Bronze Concentrate becomes patchy and uneven. Chantecaille remains smooth and even. In the presence of a moistened environment (aka: sweat, rainfall), Chantecaille Radiance Gel Bronzer held up infinitely better than Dr. Hauschka. Do keep in mind, Translucent Bronze Concentrate is all natural and predisposed to having less endurance when compared to products formulated with silicones and/or mineral oils. Makeup without Chantecaille Radiance Gel Bronzer. Makeup with Chantecaille Radiance Gel Bronzer. 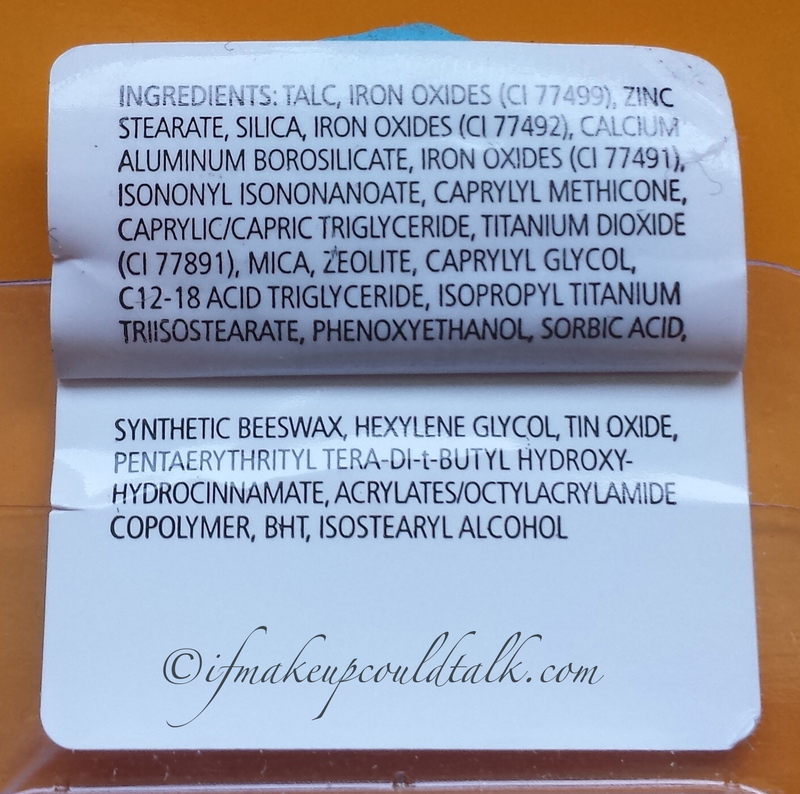 Chantecaille Radiance Gel Bronzer ingredient list (click to enlarge). Chantecaille Radiance Gel Bronzer can be found at Nordstrom, Saks Fifth Avenue, Space NK, Neiman Marcus, (where I purchased mine..if in the White Plains, NY area, at The Westchester Mall, ask for Elizabeth..so lovely and helpful). 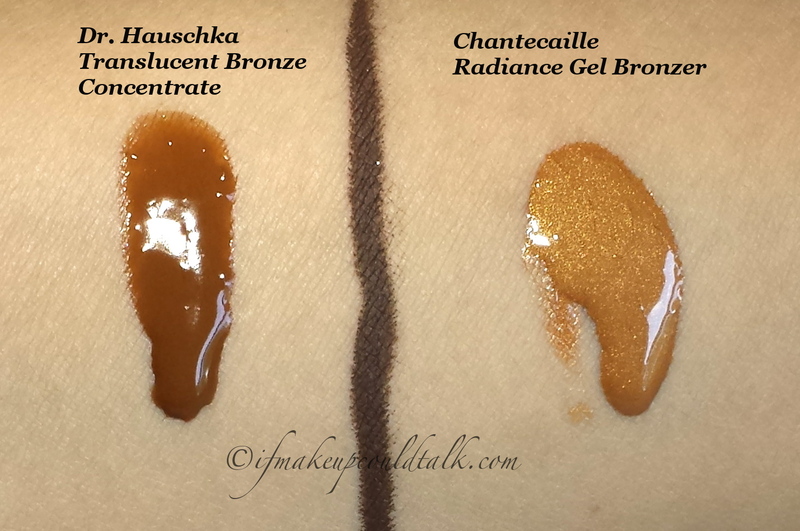 Makeup would tell you Chantecaille Radiance Gel Bronzer is a wonderful seasonal product. The bronzing effect is rather subtle, but the outcome is truly radiant and “healthy” looking. 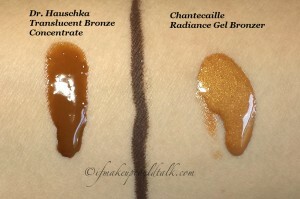 My spring time tan has yet to “spring out” on its own, Chantecaille gives me the boost in color I so desperately need and want. Until next time, be well, stay safe and be happy. 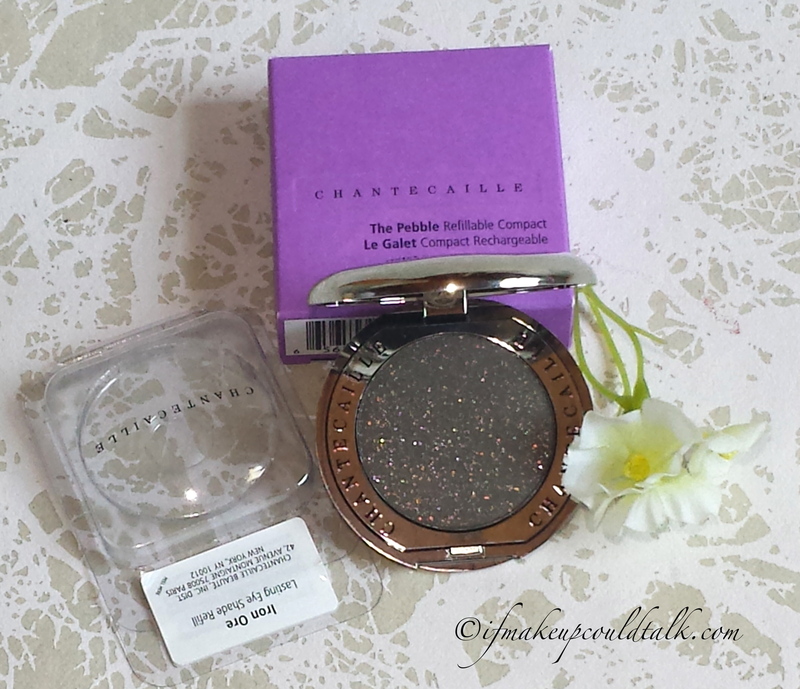 Chantecaille Lasting Eye Shade Iron Ore review and swatches. 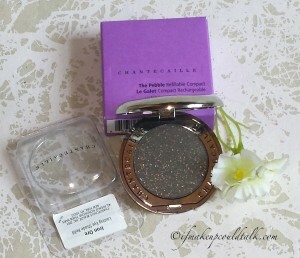 Chantecaille Lasting Eye Shade Iron Ore.
Chantecaille Beaute is a relatively new brand to me. Despite all the rave reviews from other beauty bloggers, I never paid much attention to any of their new collections. The company is family owned and operated, their passion for the environment and adding natural botanicals to their products is commendable. 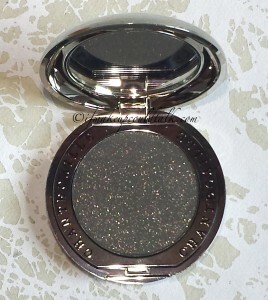 Chantecaille eyeshadows in particular, are renowned for quality and wear. 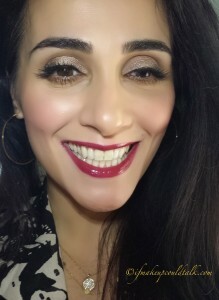 The eye shades are separated by three categories: shine eye shades (shimmer), iridescent eye shades (metallic) and lasting eye shades (matte/matte with suspended shimmers). 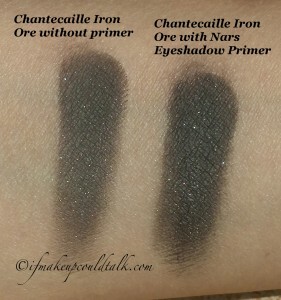 Out of all the shades, Chantecaille Lasting Eye Shade Iron Ore ($25 USD/2.5g) was the boldest and most “me” color offered. Will this new glistening crater of darkness be the start of another brand obsession? 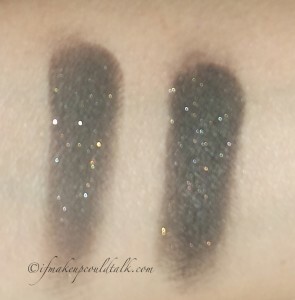 Chantecaille Lasting Eye Shade Iron Ore blurred to show the multi-colored shimmers. Beautiful deep khaki-brown matte shade with suspended multi-colored micro-shimmer. Can be applied dry for sheer coverage or wet for intense color payoff. Fingers can also be used for intense color payoff. When used with a dampened angle brush, Iron Ore makes a dynamite upper lash line eyeliner. Applies smoothly despite the drier matte formulation. Slight staining effect after color has been removed. Lasts for 10 hours + (with Nars eyeshadow primer) without any fading or creasing. 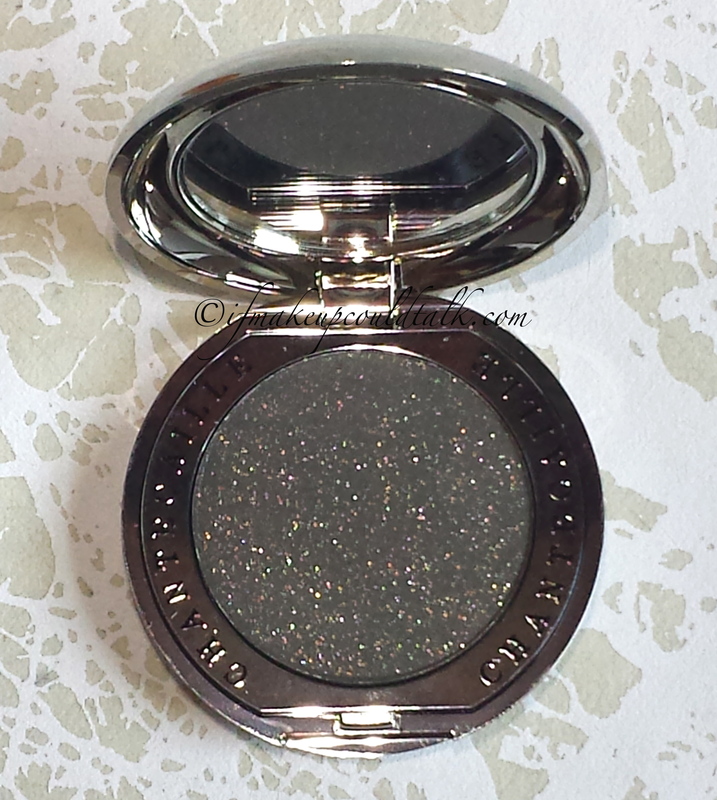 Multi-colored shimmers adhere beautifully to the skin without any fallout throughout the day. Polished shimmers are well-balanced with the matte base color for sophisticated results. Cruelty-free, no animal devired ingredients. Formulated without parabens or mineral oil (however, BHT is an ingredient). If applied in excess, on deep set eyes and hooded eyes, this highly pigmented shade can transfer to the crease. Sparkles are barely detectable if the shadow is heavily blended. Due to the soft/dry texture, residual powder does kick-up with a dry brush. Empty silver compact is sold separately. My ingredient list differs from that on Nordstrom.com. 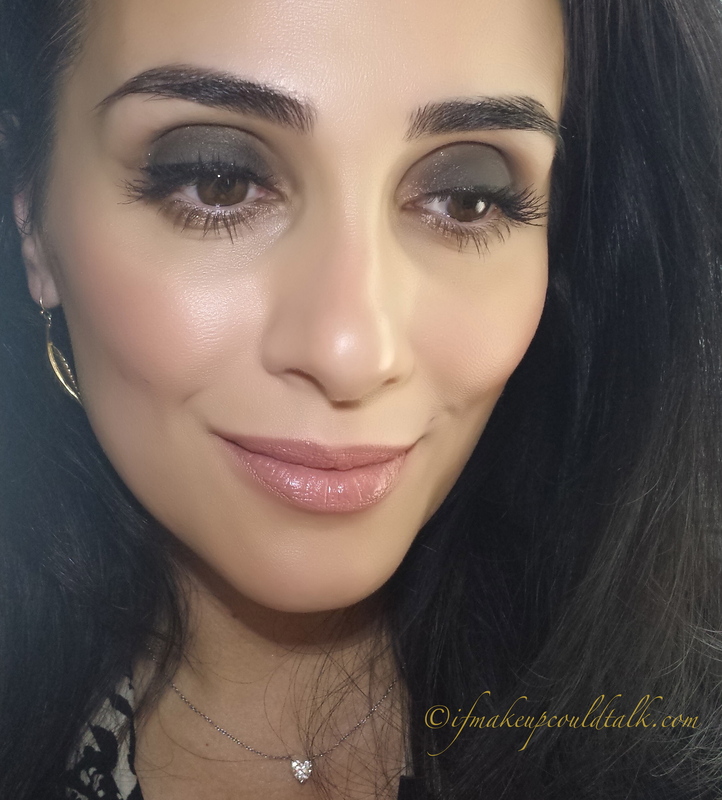 Chantecaille Iron Ore can be used all over the mobile lid for quite a dramatic eye look. 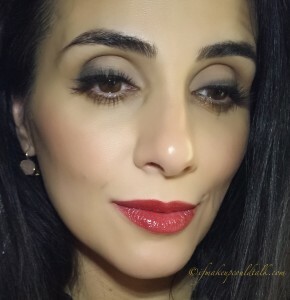 Pair this bold look with a paler shade of lip color to balance out the overall look. For those who seek a more professional approach, apply Bobbi Brown Bone 2 on the mobile lid and Chantecaille Iron Ore on the upper lash line and outer corners. Add black liquid liner and a bright lip color to complete the look. 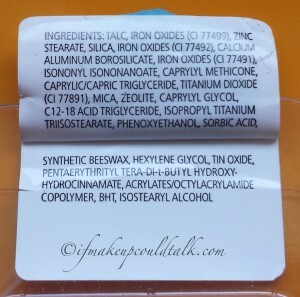 Chantecaille Lasting Eye Shade Iron Ore ingredient list. Talc, Dimethicone, Silica, Polyethylene, Phenyl Trimethicone, Trimethylsiloxysilicate, Nylon-12, Cetyl Peg/Ppg-10/1 Dimethicone, Chlorphenesin, Potassium Sorbate, Ptfe, Lauroyl Lysine, Panax Ginseng Root Extract, Polyperfluoromethylisopropyl Ether, Zinc Stearate, Tetrasodium Edta; May Contain: Mica, Titanium Dioxide (CI 77891, Iron Oxides(CI 77491, CI 77492, CI 77499), Carmine (CI 75470), Bismuth Oxychloride (CI 77163), Ultramarines (CI 77007), Manganese Violet (CI 77742), Ferric Ferrocyanide (CI 77510), Ferric Ammonium Ferrocyanide (CI 77742), Chromium Oxide Greens (CI 77288), Chromium Hydroxide Green (CI 77289), Yellow 5 Lake (CI 19140), Blue 1 Lake (CI 42090). My ingredient list differs greatly from that listed on Nordstrom.com. Iron Ore does not contain Ginseng, but does contain low levels of BHT (preservative) and alcohol. 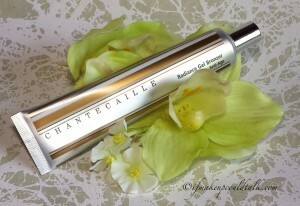 Chantecaille Beaute can be found at Nordstrom, Saks, Neiman Marcus, Barneys and chantecaille.com. Makeup would tell you Chantecaille Lasting Eye Shade Iron Ore has met all of my expectations. The rich matte base color, finely textured micro-shimmers and fantastic lasting power is a testament to the quality of the eyeshadows. Truth be told, I also admire their dedication to bring awareness to animal causes. The spring collection features the Save the Bees Palette, according to Barneys.com, “5% of proceeds will be donated to the Xerces Society to help protect bees and our environment”. A makeup company that cares for the environment, animals and using quality ingredients (for the most part) to help our epidermis..yeah, I’m officially a Chantecialle groupie 🙂 Be well and stay safe.